This property holds the major and minor axes of the ellipse representing the covered area of the touch point. This property holds the angular orientation of this touch point. The return value is in degrees, where zero (the default) indicates the finger or token is pointing upwards, a negative angle means it's rotated to the left, and a positive angle means it's rotated to the right. 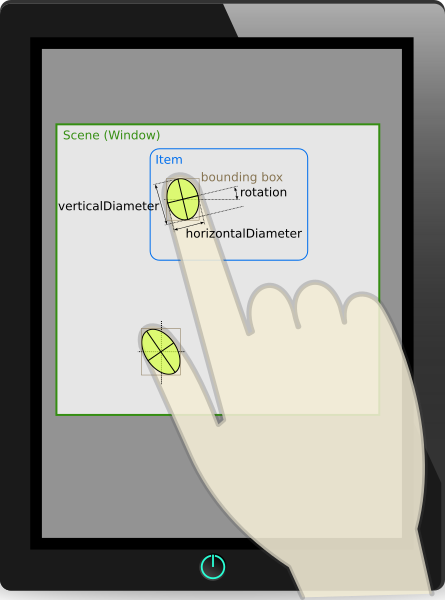 Most touchscreens do not detect rotation, so zero is the most common value. This property holds the unique ID of the touch point or token. It is normally empty, because touchscreens cannot uniquely identify fingers. But when it is set, it is expected to uniquely identify a specific token (fiducial object). Interpreting the contents of this ID requires knowledge of the hardware and drivers in use (e.g. various TUIO-based touch surfaces).